Welcome back to part two of our worried brides series. Brides worry, and they worry A LOT! But at Nazareth Hall there are so many things you do not have to worry about! Last post we talked about planning and setup. Today’s post is all about your event and timeline! Brides ALWAYS worry about decorating, and over estimate how long they will need to decorate their spaces. Our staff works hard all week setting up your room, so it is ready for you to decorate the morning of your event. Starting at 10:00 am you are given access to the ballroom to start decorating it. With the tables already set up with the dishes, linen, and chairs all you have to do is add the final touches. You would be amazed how quickly you can put your decorations out. 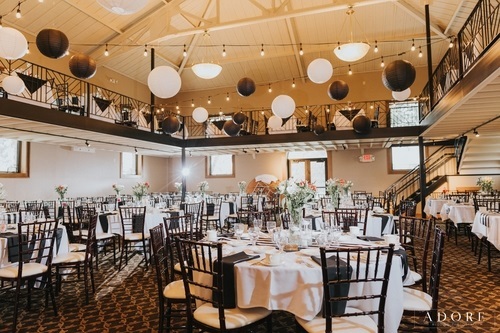 Whether you are a DIY bride, or have a team of designers on your side, you will have more than enough time to make the ballroom just the way you’ve imagined it. Florists, bakers, and designers have access to the room all morning as well, so no need to wait around for them. Go hang out in your bridal suite and relax. On top of all of this, if there is not an event the day before your wedding, you’re more than welcome to set-up early! Just ask your coordinator. Day of Coordinator The day of the wedding can be hectic. There are a ton of small things that need to be taken care of, but you can only be in one place at one time, and you want to enjoy yourself. This is where our hostess comes in. Honestly, with the focus of this post being a stress-free event, it should just be titled “An Ode to Our Hostesses”. Basically, a hostess is a day of coordinator that takes care of all your needs. Need to add a table to your ceremony site? The hostess is on it. Want to make sure everyone is ready to start the ceremony? It’s already been confirmed. I could go on and on telling you scenarios where the hostess will come in handy, but instead I’m just going to list some of their duties. 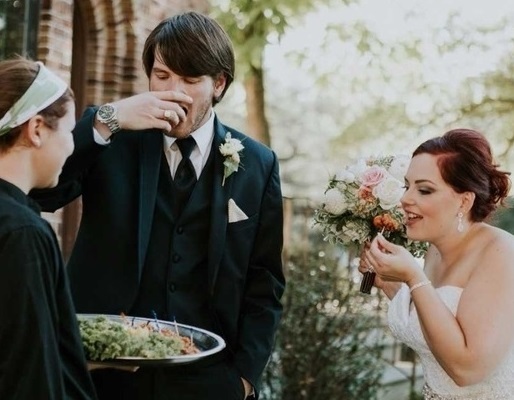 They include: making sure the timeline is followed, getting guests down to the Grotto, lighting candles, helping the bride and groom, taking head table drink orders, confirming timelines with vendors, cutting cake, making sure gifts get to the person taking them home. Anything basically that needs to get done, your hostess will make sure it is done. They are fantastic and a vital reason brides do not have to worry at Nazareth Hall. Nazareth Hall is a huge place, and sometimes we have multiple weddings, but that doesn’t mean you have to worry about your guests getting lost. First off, we have a sign that tells guest which rooms you are in, and how to get to each room. We also have a marque with your name on it outside of your ballroom, bridal suite, and class room. But sometimes signs are over looked, and that’s why we have a member of our staff directing guest where to go and answering questions. Some couples designate ushers to direct people, but we are always present to make sure everyone gets to the correct place. Our staff is highly experienced, and they know just when to line up the bridal party. If you have a ceremony in the chapel, it takes about a minute to pull everyone together. 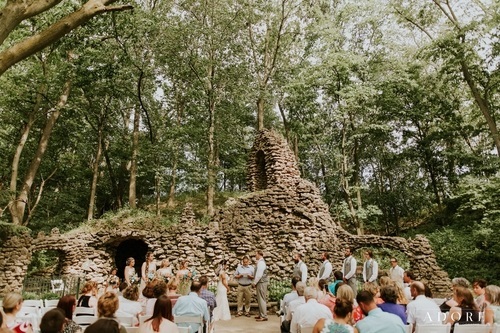 If you have a Grotto Ceremony it takes a little longer. But have no fear! Typically, your hostess will take groomsmen down on the golf cart first, then the bridesmaids, and lastly the Bride and the person giving her away. The timing is a science, and our coordinators are experts. Use your last moments as an unmarried individual to meditate and reflect, not worry about who is in place and who is not.